Texas Holdem style Poker Tables are very popular. Build your own with free woodworking plans instructions. The plan listed here are hosted at other web site so the quality of the information and instructions varies. Please choose a project that closely matches your skill level. What could be more enjoyable than pulling a chair up to this classic poker table for a game of cards with a few friends? But that will come later. First, you will get to take on the challenge of building the table. The cutting diagrams and materials list are available to download in this Online Extra. When it came to building the poker table in this issue, we chose to use a pre-made pedestal base. But if you want to make the table out of a wood other than red oak, you might want to try making your own pedestal base. The patterns are available to download in this Online Extra. Here is my first poker table. It is based mostly on Mark Junells very popular and well documented design. Kudos, Mark, for setting such a high standard. Australian Woodsmith is a practical magazine for all woodworkers. From Issue 44. 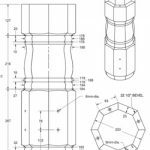 Drawing and layout only for the poker table legs. Australian Woodsmith is a practical magazine for all woodworkers. From Issue 44. Layout and measurement diagram only for this poker table pedestal base. Scott Keen shares his knowledge of building a poker table. 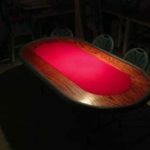 Chris Norrick details his experience of building a racetrack style poker table.